Coca‑Cola’s history has got a lot of bottle - more than 115 years’ worth, in fact. The world’s favourite soft drink started life as a soda fountain beverage, selling for five cents a glass, but it was only when a strong bottling system developed that Coca‑Cola became the world-famous brand it is today. Mississippi shop owner Joseph A. Biedenharn began bottling Coca‑Cola after he was impressed by its sales. He sold the drink to his customers in a common glass bottle called a Hutchinson. At the time Biedenharn sent a case to Asa Griggs Candler, who owned the Company. Candler thanked him but took no action. 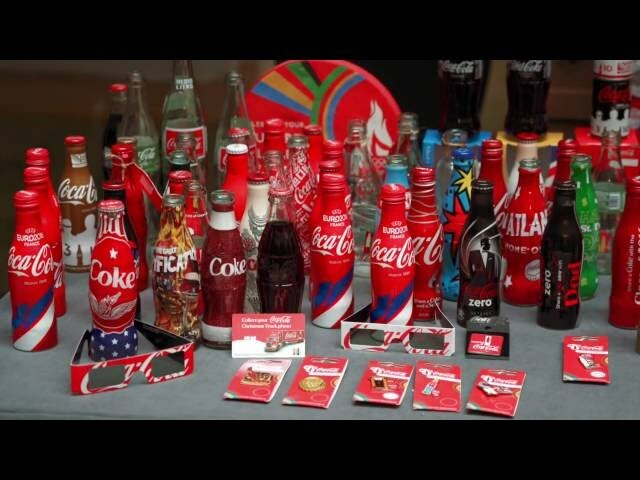 One of his nephews had already urged that Coca‑Cola be bottled, but Candler focused on fountain sales. Bottlers worried that a straight-sided bottle wasn’t distinctive enough and that Coca‑Cola was becoming easily confused with ‘copycat’ brands. Glass manufacturers were approached to come up with a unique bottle design for Coca‑Cola. The Root Glass Company of Terre Haute, Indiana, designed with the famous contour shape, which won enthusiastic approval from Coca‑Cola in 1915 and was introduced in 1916. Six pack carriers of Coca‑Cola bottles were introduced to encourage people to take their drinks home – and were a huge hit. For the first time, the volume of Coca‑Cola sold in bottles exceeded the amount sold through soda fountains. The Coca‑Cola Contour Bottle was the first commercial product to appear on the cover of TIME magazine, establishing Coca‑Cola as a truly international brand. Also this year, the first television advert featuring Coca‑Cola's Contour Bottle appeared during CBS' The Edgar Bergen-Charlie McCarthy Show. For the first time, people could buy different sized bottles of Coca‑Cola. As well as the traditional 6.5 ounce contour bottle, shops also started selling larger 10, 12 and 26 ounce versions. The Contour Bottle with the word ‘Coca‑Cola’ written on it received its first trademark from the US Patent and Trademark Office. The Coca‑Cola Contour Bottle was granted a second trademark for the contour shape itself, with no words written on it. Coca‑Cola introduced the world to the two litre PET plastic bottle. It became popular for a lot of reasons: it doesn’t break; it’s re-sealable, lightweight and recyclable. Coca‑Cola introduced the ultra-glass Contour Bottle designed for improved impact resistance, reduced weight and cost. These bottles are 40 per cent stronger and 20 per cent lighter than the original Coca‑Cola Contour Bottle – saving approximately 52,000 metric tons of glass in 2006. Coca‑Cola joined forces with design firms from five continents to launch a new aluminium Contour Bottle called the ‘M5’ (Magnificent 5). Coca‑Cola launched the innovative PlantBottle in the US, a completely recyclable PET container made with 30 per cent plant materials, including sugar cane extracts. Coca‑Cola swaps its iconic logo with Great Britain’s most popular names for the summer-long ‘Share a Coke’ campaign.